60 Stormtroopers and Clone Troopers of Star Wars #infographic ~ Visualistan '+g+"
40 years after the release of the original Star Wars, the franchise is back in the spotlight. On Monday October 9th, they released the new Star Wars: The Last Jedi trailer and fans are going bonkers. If you want to avoid spoilers (which I recommend), then you should simply have faith in Disney, Lucasfilm, and the cast and crew and show up to see the movie in theaters. In fact, this is what the director and Mark Hammil recommend. If you're interested in learning more about what's to come, then head on over to Youtube and check the trailer out. 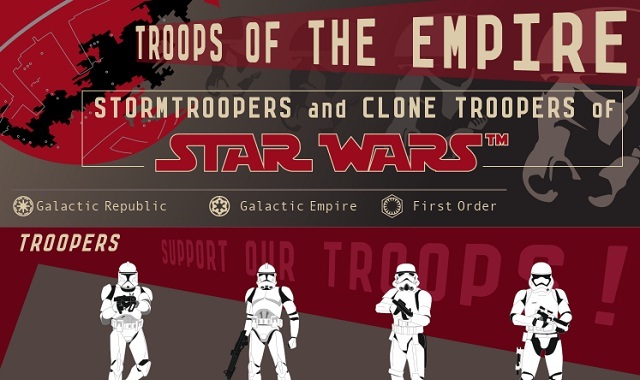 In the short term, however, feast your eyes on this stellar chart from CostumeCraze.com that showcases 60 different types of Stormtroopers and types of Clone troopers from every canonical (and expanded universe) entry in Star Wars lore. Which warrior of the Galactic Empire, Galactic Republic, or First Order is your favorite?